Alcohol Action Ireland is also calling for the introduction of minimum pricing to target binge drinking. NATIONAL CHARITY ALCOHOL Action Ireland has today urged the government not to lower excise duty in the next budget. The charity today released its pre-Budget submission and said that in recent years increases in excise duty have reduced alcohol consumption and generated significant additional revenue for the Exchequer. Cuts to the duty have had the opposite effect, it pointed out. “Therefore, to cut excise duty makes no sense for the physical, mental or financial health of the nation,” said CEO Suzanne Costello. 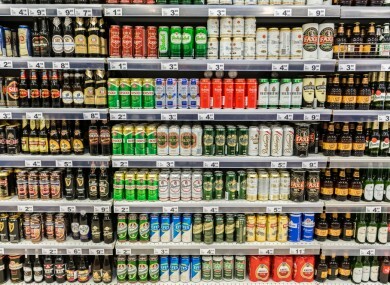 When excise duty was cut on all alcohol products, consumption increased by 6% and excise receipts for the State were reduced by €142 million, while in 2013, when there was an increase in excise duty on all alcohol products, consumption fell by 9.5% and excise receipts increased by almost €150 million. The alcohol industry has been calling for a cut in the duty, claiming high prices are having a huge impact on businesses – especially pubs – and on tourism. However Costello said there is “a high price to pay for cheap alcohol as it leads to increased consumption and that leads to greater harm being caused for individuals, families and communities throughout Ireland”. Responding to this, the Drinks Industry Group (DIGI) said that the budget submission glossed over some of the facts, pointing out that “increasing tax on alcohol, including excise does not address misuse of the product”. The group said 1,000 pubs in Ireland have closed since 2007 and that the pub is “widely considered to be one of the safest places to drink by health professionals”. If we want to tackle alcohol abuse in this country we need to take targeted measures such as these instead of making headline grabbing pronouncements about measures which will cost jobs throughout the country by continuing to drive people to buy their alcohol on promotion. As we have seen from last year’s budget excise tax increases, the price difference between alcohols bought in the pub and that bought in the off-trade are encouraging hard-pressed consumers to avoid the pub – even though health experts throughout Ireland have agreed that it is the best place to drink. 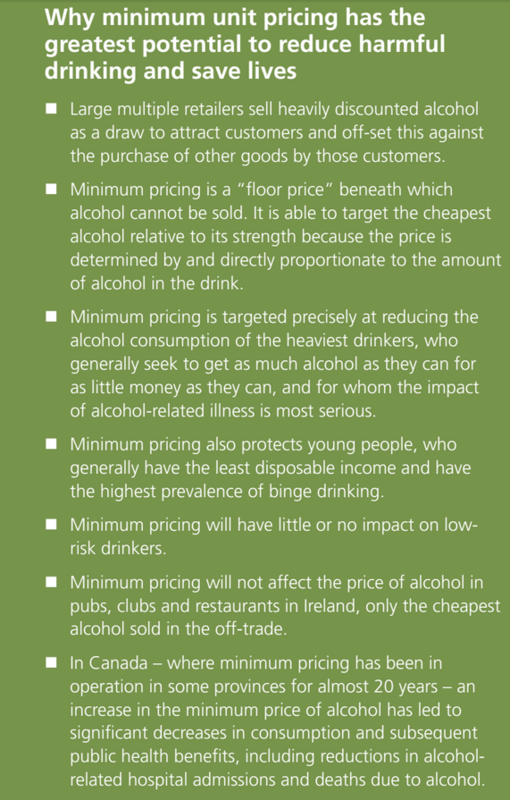 In Alcohol Action Ireland’s submission on Budget 2015, the charity also called for the introduction of minimum pricing. Declining pub trade is also being used as a rationale for calls to cut excise duty, but following the initial impact of the recession, it is cheap alcohol in the off-trade, particularly supermarkets, that is now the primary reason that pubs are losing customers and people’s drinking habits in Ireland are changing, with 60% of our alcohol now purchased in the off-trade. Only the introduction of minimum unit pricing will properly address the sale of heavily discounted alcohol in the off-trade. The submission says minimum pricing would target binge drinkers and would have little or no impact on low-risk drinkers. It also helps protect our young people, who generally have the least disposable income and have the highest prevalence of binge drinking. A ‘social responsibility levy’ is also proposed in the submission. This would see the alcohol industry contribute towards the cost of alcohol abuse with funds being used to promote alternatives to drinking for young people. Have your say: Do you think the government should lower excise duty on alcohol in the next Budget? Email “Higher alcohol prices are working - don't lower excise duty, says charity”. Feedback on “Higher alcohol prices are working - don't lower excise duty, says charity”.